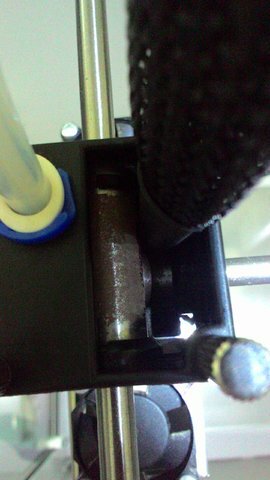 Hi guys, just a simple question: i bought my brand new Ultimaker 2 Extended+ less than one year ago (november 2016) and from several months i'm noticing rust growing on the area over the bearing's cylinder inside the extruder. Is it normal? Can that affect negatively the print quality in someway? Any solutions? Thanks. I don't think it matters that the rust is on the outside of this part, but you definitely don't want it migrating to any of the bearing surfaces. I'm going to make an educated guess that either you live in a humid area, or your printer is in a basement or other room that suffers from "dankness". In such a case I would make sure to lubricate the metal parts of the printer a little more frequently than recommended in the manual (sewing machine oil on the XY rods, grease on the threaded Z rod). It would also be a good idea to place a dehumidifier near the printer. Bonus: environmental control makes for better prints in addition to a happy machine.